Gabriel Agbonlahor's early goal gave Aston Villa a battling victory at Anfield that moves them up to second place in the Premier League table. Villa were also looking dangerous on the break but their cause was being helped by Liverpool's lack of cohesion and cutting edge going forward. Villains back on the straight and narrow? Villa's return of 10 points from their opening four league games is their best tally for 16 years. In that 1998/99 season, Villa topped the table on Christmas Day and eventually ended in sixth place. The home side increased the pressure but a finishing touch continued to elude them, with Dejan Lovren heading over and Philippe Coutinho firing against the post. That was the nearest Liverpool came to an equaliser, and Rodgers will need his new-look side to show a vast improvement in the final third when they face Bulgarian side Ludogorets Razgrad in the Champions League on Tuesday. Liverpool manger Brendan Rodgers: "We were slow in our pressing and passing early on and gave away a bad goal, but then we upped it. "It was a frustrating day but I think it was a combination of Aston Villa defending well and us failing to find that wee bit of quality. We had enough of the ball but could not find the penetration in the final third." Aston Villa manager Paul Lambert: "It is one of toughest places to come in Europe, let alone Britain, but I think we deserved the win. "There is a lot of momentum on and off the pitch at this club, the players have been excellent as a group and the supporters have stuck with it and now our young guys are turning into young men." Match ends, Liverpool 0, Aston Villa 1. 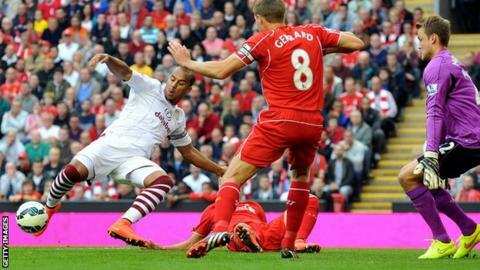 Second Half ends, Liverpool 0, Aston Villa 1. Foul by Rickie Lambert (Liverpool). Corner, Liverpool. Conceded by Alan Hutton. Attempt blocked. Dejan Lovren (Liverpool) right footed shot from outside the box is blocked. Assisted by Steven Gerrard. Offside, Aston Villa. Brad Guzan tries a through ball, but Charles N'Zogbia is caught offside. Attempt blocked. Philippe Coutinho (Liverpool) right footed shot from outside the box is blocked. Substitution, Aston Villa. Carlos Sánchez replaces Tom Cleverley. Offside, Liverpool. Jordan Henderson tries a through ball, but Javier Manquillo is caught offside. Attempt missed. Raheem Sterling (Liverpool) right footed shot from the centre of the box misses to the right. Philippe Coutinho (Liverpool) hits the right post with a right footed shot from the left side of the box. Assisted by Alberto Moreno. Corner, Liverpool. Conceded by Nathan Baker. Kieran Richardson (Aston Villa) wins a free kick on the right wing. Substitution, Liverpool. Fabio Borini replaces Lazar Markovic. Attempt missed. Raheem Sterling (Liverpool) right footed shot from outside the box is high and wide to the right. Assisted by Alberto Moreno.